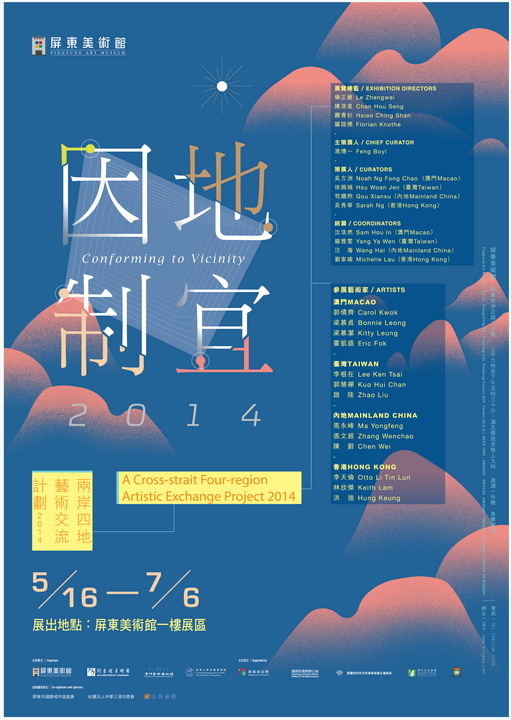 The sixth Cross-Strait Four Regions Artistic Exchange Project takes “Conforming to Vicinity” as its theme, presenting the relationships of exchange between the cultural environments of these four regions. “Conforming to Vicinity” implies that as a part of this artistic exchange, the artists of these different regions will engage in “on-the-spot creation and exhibition” of their differing understandings, judgments and imaginations of the histories, memories and realities of these regions scattered across the straits. Beginning with the exhibition premier in Macao, the artists will draw from their past creative concepts, experiences and mediums to constantly expand and evolve their exhibition artworks based on the cultural traits and their perceptions of the different regions, creating a domino effect where the artworks will maintain their basic conceptual threads while picking up traces of each region. It is hoped that this exhibition will allow audiences to understand the entire process of artistic conception and creation to see that there is no set form for the creation and exhibition of art, while artistic expression enjoys limitless possibilities. Jointly organised by the University Museum and Art Gallery of The University of Hong Kong (UMAG), the Macao Museum of Art under the Civic and Municipal Affairs Bureau, the He Xiangning Art Museum and the Pingtung Art Museum, “Conforming to Vicinity – A Cross-Strait Four-Region Artistic Exchange Project 2014” will showcase the latest artworks by thirteen artists from Hong Kong, Macau, Taiwan and Mainland China. Taiwan will be coming up as the second stop of this touring exhibition. The artworks will go on display from the 16 May until 6 July at Pingtung Art Museum. © 2012 Li Tin Lun. All Rights Reserved .